NetCredit is the personal loan solution for bad credit borrowers to get back on your feet. When I destroyed my credit in 2008, my FICO dropped to as low as 580 so I understand where you’re coming from. Traditional bank loans were out of the question and even some of the peer-to-peer loan sites like SoFi wouldn’t approve my application. I was finally able to get a consolidation loan but it wasn’t easy. The thing is, getting that consolidation loan was the first step to getting out from under crushing debt and getting my finances back on track. Without the lower payments from the loan, it would have been bankruptcy for sure. Making regular payments on my personal loan, I also increased my credit score to the point where I could refinance at much lower rates and save more money still. But it all had to start with that loan and there aren’t many online lenders that will approve a credit score under 600 FICO. NetCredit has the lowest credit score requirement I’ve seen and can be your bad credit option before resorting to payday loans or cash advances. Besides reviewing NetCredit and loan requirements, I’m going to show you how to get a consolidation loan and the refinancing strategy I used to save money as my credit score increased. NetCredit is an online lender based in Chicago and started in 2012. The company issues personal loans from Enova Financial, a lender with stock trading on the New York Stock Exchange. NetCredit specializes in personal loans to people with very bad credit. While traditional banks and credit unions won’t accept borrowers with FICO scores below 680 and even most online lenders make the cutoff at 620, NetCredit can accept borrowers as low as 550 FICO. NetCredit offers unsecured installment loans with a completely online application process. The application process, more on this below, takes less than five minutes and money is usually available within one to three business days. Loan amounts are lower than at other online lenders but work well for the purpose of the loan, as a first step to getting your debt under control. Loans are available from $1,000 to $10,000 and can be repaid from six months to five years. Rates on loans start around 30% and can go as high as 140% for borrowers with a credit score below 600 FICO. That’s well above other p2p sites but still well below the 500% annual comparable rate you’ll pay on payday loans or cash advances. Because of the high interest rate, you don’t want to depend on a NetCredit loan for too long but it can be a great first step to get back on your feet. Check your rate on a few different personal loan sites to make sure you get the best rate available. If you can only get a loan on NetCredit, borrow only as much as you need for the next 12 to 18 months. You can borrow on longer terms, up to five years, to afford the payments. Within 12 months of regular payments, your credit score will be higher and you should qualify for a lower interest rate to refinance any remaining debt. The NetCredit application is completely online and takes less than two minutes. NetCredit does a soft-pull on your credit which means it won’t hurt your credit score to check your rate. You start by creating an account and answer a few questions about your income and the money you need. The review process for applications is instant and NetCredit will approve your loan for an amount depending on your income. It will then show an interest rate and your monthly payment. If you agree to the loan, funds are usually deposited directly into your bank account the next day and you start making payments in a month. Another advantage of NetCredit is the flexible payment options available to borrowers. Besides the traditional direct transfer, you can also make your payments through money order, MoneyGram or Western Union. If you can get a loan on one of the other sites, you can still try this strategy to refinance at a lower rate. Some loan sites charge an origination fee but will waive in when you refinance. None of the sites charge prepayment so you can pay your loan off quickly to save on interest. The credit score requirement is the biggest advantage of NetCredit. No other personal loan site I’ve reviewed will approve a loan for borrowers with a credit score of 620 or lower. NetCredit advertises loans to borrowers with a 550 FICO. Rates on NetCredit loans vary depending on your state but generally start around 30% and go as high as 140% annually. 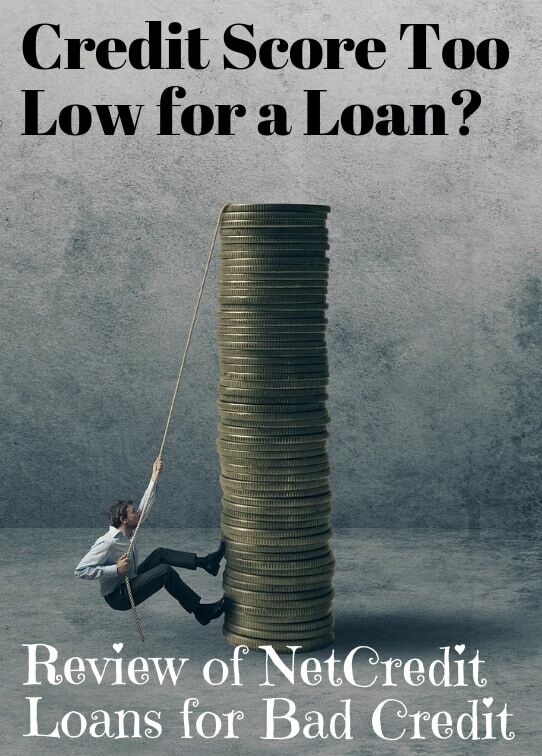 That’s well above most personal loan sites with rates that range from 7% to 34% but still way below the 500% annual rate you’ll pay on cash advance loans and at pawn shops. NetCredit loans are available in Alabama, Arkansas, California, Delaware, Florida, Georgia, Idaho, Indiana, Kansas, Kentucky, Louisiana, Michigan, Missouri, Mississippi, Montana, North Dakota, Nebraska, New Mexico, South Carolina, South Dakota, Utah, Virginia, Washington, and Wisconsin. A NetCredit comparison to other loan sites may not be entirely fair because different loan sites serve different borrowers. Some websites like Lending Club and SoFi offer lower rates but only accept the strongest credit scores. Even other personal loan sites like PersonalLoans and Upstart have credit score cutoffs around 620 FICO. NetCredit is the only online lender I know that lends to borrowers with credit scores below 600 FICO. NetCredit has an A- rating from the Better Business Bureau with most of the complaints from borrowers after their application was denied. This is typical for personal loan companies, even NetCredit can’t accept every application. There are a few legitimate complaints against the company, many about the higher interest rates on loans and borrowers that misunderstood loan terms. Overall, customer reviews are positive from borrowers that got a loan and the company has a four-star rating on Trustpilot (150 5-star reviews out of 203 total). I’ll be the first to admit that NetCredit loan rates aren’t something you want to be under for more than absolutely necessary. Use NetCredit to get a loan when you don’t qualify for a lower rate. Make regular payments and refinance your loan when your credit score increases in a year or two. NetCredit isn’t available in all states but is expanding its area and can usually accept applications from borrowers with a credit score as low as 550 FICO. That makes it the best personal loan site for bad credit borrowers and payment plans range from six months to five years. Debt consolidation is a controversial strategy to paying down your debt. Sometimes it’s the only option though when you’re struggling to make debt payments and your credit score is too low for traditional loans. NetCredit is a great option for borrowers that don’t qualify on another P2P site for lower rates and can help you increase your credit score fast.